(Host) Bookmobiles are libraries on wheels that stop at schools and street corners. But in many Vermont towns and villages, they’ve fallen victim to rust and budget cuts. In the Northeast Kingdom town of Lyndonville, the Cobleigh Library managed to keep its van rolling until about a month ago, when it died. But patrons are mounting a campaign to put it, or a new one, back on the road. VPR’s Charlotte Albright tells the story. (Albright) If you want to hear first-hand what it’s like to go through a whole week without a single visit from the bookmobile lady, just ask the three- four- and five-year-olds at Stay and Play, a day care center in Lyndonville. (Kids) "’Cause we miss the bookmobile. Yeah, we miss the bookmobile until it comes here. I miss it a lot more. I miss it a lot more." (Albright) It’s not that they don’t have or get books to read-or read to them. Abby Heimlich, Cobleigh’s bookmobile librarian, brings them a fresh book bag full every couple of days, using her own car-and she holds story hour. But day care provider Anneka Bickford says that’s not as thrilling as having a big brightly painted vehicle roll into the driveway and open its doors wide, so kids can browse and choose their own books. (Bickford) "It’s getting the children involved with what a library is, how to check out books, how to return books. They would do programs with the children, singing, dancing, themes. So it’s the excitement of the library that we can’t give to the children." (Albright) What she and thirteen other day care providers can and will do is drum up financial support for the bookmobile. 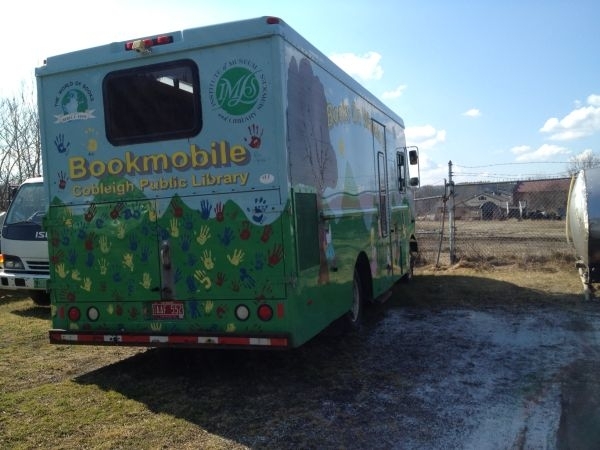 It’s not the first Cobleigh bookmobile to bite the dust because it’s just worn out, but Librarian Cindy Karasinski says replacement costs have skyrocketed. (Karasinski) "The first bookmobile was out of the dump. It was a plumber’s van out of the dump. You know, will we look for another used vehicle and try to refurbish that? New bookmobiles, when it was new, this one was over $90,000. So that seems not to be the way we are going to go." (Albright) Sadly, Karasinksi says, the kind of grants that used to fund bookmobiles have all but dried up. But one Northeast Kingdom librarian remembers when rolling libraries were all the rage-even a little scandalous, for single librarians. Ninety-two-year-old Eleanor Simonds drove one around St. Johnsbury back in the ‘40s, right after she got her library science degree from Simmons College outside of Boston. (Simonds) "I had a great aunt that lived with my family at that time and I was telling her about it and she said, ‘Intimate, isn’t it?’ Well the idea of riding around all day with a strange man, that’s what she thought was intimate, of course." (Albright) But for Simonds it was a dream job, spreading the love of reading into remote corners of the Northeast Kingdom. She hopes the Cobleigh bookmobile gets a second chance. But there are some in town who feel that the bookmobile has served its purpose, and has become a financial burden instead of an asset. Librarian Cindy Karasinski says the final decision will be made by the library board with citizen input. For VPR News, I’m Charlotte Albright, in Lyndonville.